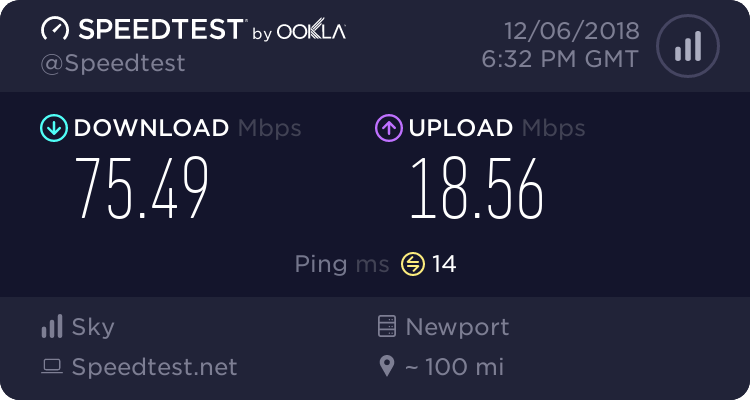 ive been looking into switching to sky from virgin and i was wondering if being 1.57km from the nearest exchange(springfield) is good and what are the things that can effect the speed of the broadband? Also what are the advantages of ASDL2+? also will i be able to keep my router? ive got a dlink DI 624 and i was wondering if i can just plug it into a asdl modem. also is it easy to switch? sorry of ive posted in the wrong section or any spelling mistakes. Your distance from your exchange is not bad, you are under a mile and i would consider 3 miles to really effect your speed. The factors that really affect your speed would be your distance from your exchange, the quality of the line, and the exchange could be a factor. sky may put you on ADSL2 with bb max if your line can support speeds above 8mbps. I think your Line Attenuation is a big factor, if its too high you may not be put on ADSL2 because its less stable. Last edited by mike_b; 09-08-07 at 04:17 PM. Your distance from ur exchange is not bad, u are under a mile and i would consider 3 miles to really effect your speed. The factors that really affect ur speed would be your distance from your exchange, the quality of the line, what your exchange can support (some exchanges may not be able to support more than 3mbps). sky may put you on ADSL2 with bb max your line can support speeds above 8mbps. I think your Line Attenuation is a big factor, if its too high you may not be put on ADSL2 because its less stable. how can i check for this? also does it matter if theres roughly 13000 connected to the exchange? this is the exchange Samknows - CMSPR exchange im currently on virgin and i havent been on any other since dial up! so how good is it is it best to ask others in my area about broadband? will i have to use there router? Last edited by arj154; 09-08-07 at 04:22 PM. Are you on a Virgin cable connection at the moment, if you are, keep it until you have Sky up and running. Generally, cable connections are better than phone lines for broadband. Have you checked that you can get a Sky connection to the exchange, it was one of the earlier ones to be enabled, so I would be surprised if it is not sold out. If you do decide to change, before you commit yourself, make sure you get a firm assurance that Mid or Max is available, by letter or email, don't believe what you are told on the phone. Given your distance from the exchange, provided your line is good, you should get 13 to 15.5 Mb, although you will not know for sure until you are connected. The actual number on your exchange does not matter much, provided Sky have spaces available. It is part of the T & Cs that you use the Sky router. thanks! i was also wondering wiether its true that i will have to use bts phone service for 3 months? i was connected before. Also will my current wireless adapter(dlink dwk G132) work with the netgear router? Also what phone socket will they use? we have 3 phone sockets in out house so will it be possible to have the router plugged into any of them or are they wired differently because we are on cabe? you have to use BT sockets, and i'd personally recommend using the router in ur master as it cuts out the possibility of bad extentions causing noise on the line which will affect speed - and as ur wireless u can do it. I don't think you have to be connected to BT for any length of time to qualify, having a BT compatible line is the main thing. There is no reason why your Adapter should not work with the Netgear, it is capable of 108 Mbs, as is the router. The phone socket will have to be a BT one, if you don't have one, you will need to get one installed. I don't know if Cable sockets are compatible, they may be, if not they would have to be replaced.